Pinball wizards out there may want to have a look at ZEN Pinball: Rollercoaster [App Store] by ZEN Studios. This iPhone title comes to us from the developers behind the popular XBOX Live Arcade title Pinball FX that’s so realistic its downright scary. While it doesn’t quite live up to its XBOX 360 bretheren, ZEN Pinball is a fun way to while away the time with your iPhone or iPod touch. 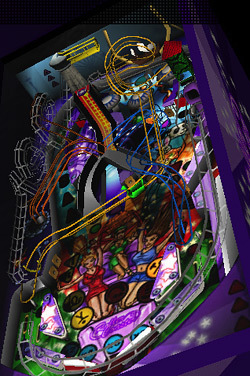 ZEN Pinball presents the player with a fairly complex 3D model of a pinball table. The default play mode has the table fixed at a mild angle that affords a nice view its intricacies, but more interesting is an “unlocked" mode that allows the user to adjust the table view angle with the iPhone’s accelerometer. I find this a vastly more appealing way to interact with the game. Flipper control is handled by the iPhone’s multitouch interface; left and right “buttons" are arrayed at the bottom and top of the screen and offer very satisfactory control. The virtual table can be nudged by shaking the iPhone (it seems impossible to trigger a “TILT," however). ZEN Pinball‘s sound effects are convincing, thought not to the same degree as big brother Pinball FX. There is a lively music track that’s muted by default. I find it best to leave it that way. The game’s framerate is solid, if occasionally less than glass smooth. I’ve seen a number of user comments complaining of framerate issues, but I’ve not encountered any slowdowns notable enough to complain about. $4.99 seems a fair price for this title. The gameplay is convincing and satisfying. Anyone with a particular penchant for pinball will likely find this title a valuable addition to their iPhone game library.